There are some amazing note-taking apps out there, some of which we have compared Springpad vs Catch vs Evernote vs OneNote - Which Is Best On Android? Springpad vs Catch vs Evernote vs OneNote - Which Is Best On Android? At one time, people actually had to carry around notebooks if they wanted to take notes - remember the once-big fad of Moleskine notebooks? Nowadays, smartphones have made most pocket objects obsolete. Why carry around... Read More , but here’s one that merits a closer look: Google Keep, a note-keeper which has a great-looking Android app and a slick webapp, and keeps both in sync effortlessly. In the months that I’ve been using it, I’ve really grown to love it. It may not have all the extensive features of Evernote, but it’s simple, gorgeous, and gets the job done. 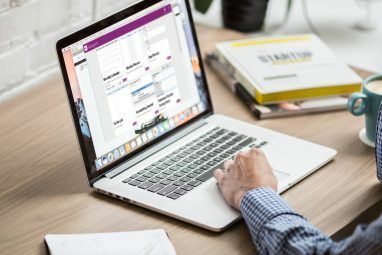 Plus, more competition for Evernote can only be a good thing; not long after Google Keep was launched, Evernote updated their app with a host of new features. It definitely depends on your needs, but for me and many other users, Google Keep is nearly perfect. Taking a note on the Keep app is a breeze. Just give it a title (or not) and start typing. Google automatically saves your work as you type, very much like using Google Drive on the Web. From the note-taking interface, you can change the color of the note by clicking on the paint palette or add photos by tapping on the camera. The photos appear above the text note (as you can see below) and if you click one, you can scroll through them as a series. Keep does four kinds of notes: basic text, checklist, photos, and voice recording. Below you can see my checklist and voice recording. The text above the voice recording is Google’s transcript of what I said, and it managed to be completely accurate. Of course, the sound file is saved there as well so you can listen to that. It’s pretty easy to switch between the four different modes. 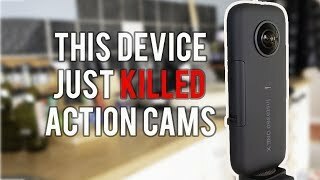 The voice recording can be deleted by pressing the X on the right, turning it into a text note. Photos can be added to any note, and you can also convert any text note into a checklist under the Options menu. You can also set reminders for any of your notes. These can either be triggered by location or time. So you could program your note to pop up as soon as you get to work or return home, or you could just choose a particular time. That’s about all there is for taking notes here. It’s easy to just install and use, no learning curve. You have only two different ways of displaying notes in Keep: single-column or multi-column. In either case, you can rearrange notes by tapping and holding on one, then dragging it around. Of course, you can also change the color of your notes to more easily keep track of different categories. Swiping a note to the left or right will archive it, which behaves very much like archiving in Gmail. The note isn’t completely deleted, but it won’t appear in your main list of notes. It will be hidden in the Archived section that can be accessed via the slide-out menu on the left. Think of it like the Recycling Bin in Windows or Trash on a Mac. Of course, everyone is going to compare Keep to Evernote. By now, Evernote is a household name and the leader in the notetaking scene, but in many ways, I like the Keep Android app better than the Evernote app. While Evernote has far more options — notebooks, smart stickers, a paid premium version, a market, etc. — the app is also subsequently much more crowded, and, in my opinion, far clunkier and harder to use. It should also be mentioned that while the free version of Evernote gives you 60MB of storage, Keep doesn’t have any stated storage limit. Now, that’s not to say that there won’t be a limit in the future; in fact, many users speculate that it could be integrated with the 15GBs users are given for Drive, Gmail, and G+ Photos, but nothing is confirmed yet. On the widget side of things, Keep offers only two different widgets while Evernote has five. On top of that, Evernote’s widgets have far more customization options for choosing the color theme, rearranging the icons, etc. If you aren’t happy with Keep’s very basic widgets, you may want to consider Evernote. However, you should note that Evernote requires a separate download [No Longer Available] for the widgets for some reason, whereas Keep’s are bundled into the app. As of right now, Google hasn’t announced any plans to bring Keep to iOS — although I’d be surprised if they didn’t eventually — but Evernote already has a powerful iOS app Evernote: A Must-Have App for the iPhone and iPad [iOS] Evernote: A Must-Have App for the iPhone and iPad [iOS] In the last several months, the iOS versions of Evernote have undergone a significant overhaul of their user interfaces, closely mirroring the design and features of the counterpart web and Mac applications. We have added... Read More that recently underwent an iOS 7 makeover. Both apps have a Web version, but many of the same differences exist there: Keep is simpler, but Evernote has far more features and options. Once you’ve set down your phone and returned to your computer, you have a couple of different options for accessing Keep. One is going to drive.google.com/keep to access the Web interface, and the other is downloading the Chrome App. 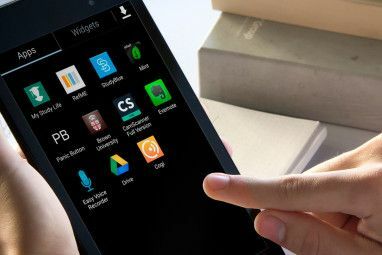 Normally, Chrome apps are little more than shortcuts to their Web interfaces, but recently, Google announced new desktop apps that can run offline and outside of the browser. You still download it from the Chrome Web Store, but now it can be pinned to your taskbar as a separate app and launched without opening Chrome. Regardless, the app looks nearly identical to the Web version. Like the Android app, it keeps things simple with a minimalist design. The largest change is that colored notes are no longer fully colored, they just have a colored strip along the top. That’s kind of disappointing for me; I like the brightly colored notes in the Android app. 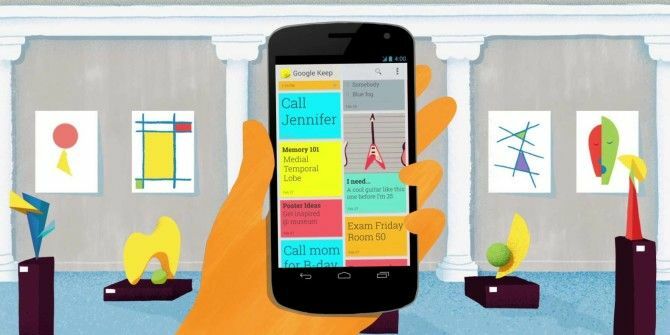 If you’re looking for an easy-to-use, modern-styled note-taking app, Google Keep is for you. 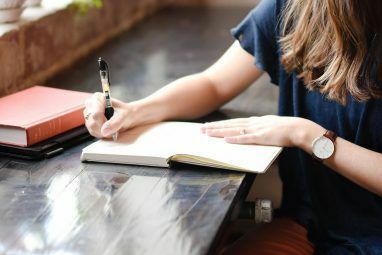 Evernote has a lot of great features Why You Should Be Using Evernote As Your Go-To Place For Remembering Everything Why You Should Be Using Evernote As Your Go-To Place For Remembering Everything Remember Everything. That’s the Evernote motto and that’s what it allows you to do best. If you aren't familiar yet with Evernote, you’re in for a real treat! If you have heard of it, but... Read More , but I’m going to stick with Keep; it does everything that I need, and it does it well. What is your favorite note-taking app, and why? Do you think Keep will end up going the way of Reader? Let us know in the comments! I use both Keep & Evernote. Each has its strength. Keep is good for quick note, temp items, easy to forget stuff, small project control etc. I put more permanent stuff in Evernote, since its size I can't sync offline to all my devices so Keep is a lighter weight star. The web- app does not work on my Linux- machine! Crap! Just an empty gray pop-up. i am already using evernote and this is not worth the switch. "While Evernote has far more options ... the app is also subsequently much more crowded, and, in my opinion, far clunkier and harder to use." I liked Catch Notes the best, but since it closed down, I've been begrudgingly using Evernote. As much as I want to like Keep, I think I'll keep suffering with Evernote for now.